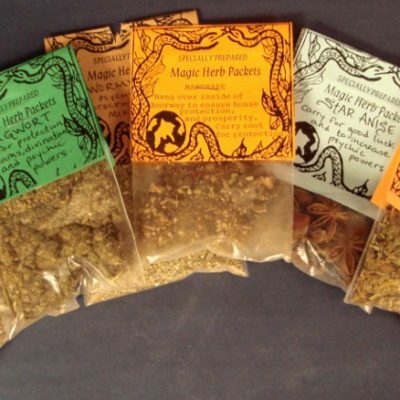 We carry a selection of natural herbs that have been commonly used by many traditions to achieve magickal and spiritual effects. 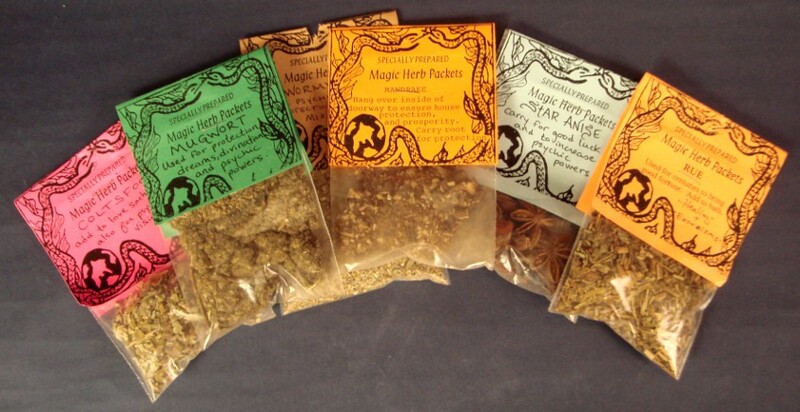 Herbs can be carried in mojo bags, sprinkled by bedsides and doorways, burned as incense, mixed into candle wax, and many other different uses. Mugwort - Used for protection, dreams, divination and psychic powers and intuition. Chamomile - Used for relaxation, sleep, meditation, as well as attracting Love and Money. Rose Buds - A universal ingredient in Love spells, Rose buds are also used for relaxation and prophetic dreams. Coltsfoot - Add to love sachets, also used for spells involving serenity, and to achieve psychic visions. Mandrake - Hang over your doorway to ensure house protection and prosperity. Carry with you for protection. Skull Cap - Encourages fidelity in relationships, also used for attraction and money spells. Lavender- Used in love spells, purification rituals and enhance Happiness. Spearmint- Hang in sachet in bedroom to protect children. Burn to attract your lover. Catnip- Cat magic, love, beauty and happiness. Valerian- Use for love, calm, purification, protection sleep and serenity. Jasmine- Add to sachets for love and wealth. Burn in bedroom for prophetic dreams. Penny Royal- Traveler's protection, peace, removes curses. Mistletoe- Hang above doorway or bed for protection from evil spirits and nightmares.